Like a fine delicatessen, a well-stocked garden center serves up a horticultural feast this month: tables laden with cool-season bloomers like English daisies, pansies, and violas (pictured); sawdust-filled beds holding bare roots of apples, berries, grapes; and bins of flowering bulbs ― begonias, dahlias, and gladiolus ― all ready to sprout. We asked Dennis Saulsbury, who co-owns Raintree Garden and Gift Center in Seaside, Oregon, for some spring shopping suggestions. Annuals. 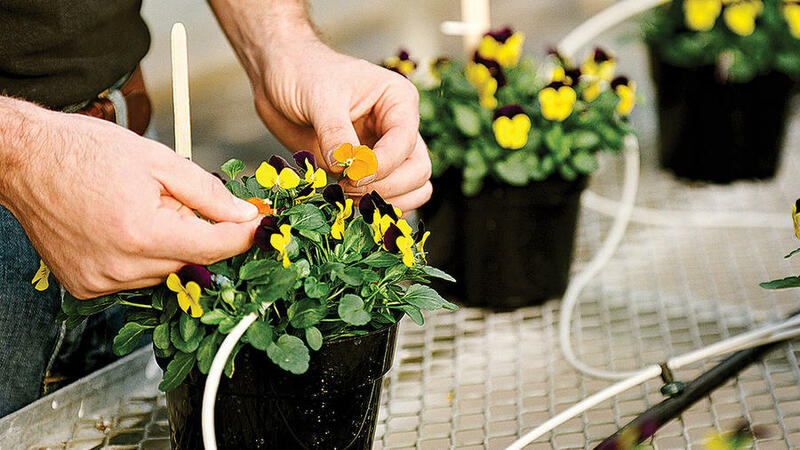 Violas offer greater variety than ever. Fruits and berries. ‘Toro’ blueberry is incredibly fruitful. For big strawberries, you still can’t beat ‘Seascape’. Perennials. Hellebores bear the earliest spring blooms. Shrubs. Try Daphne odora and any sarcococca; the fragrance of their sweetly scented flowers carries well in cold air. Vines. Evergreen clematis (C. armandii) is covered with fragrant white flowers this month. Raintree Garden and Gift Center is at 84794 U.S. 101 (at U.S. 26) in Seaside; (503) 738-6980.